I always love when the talented Brooke Roberts Photography sends over her recent work, but I was particularly excited when this National Museum of the Mighty Eighth Air Force styled shoot showed up in my inbox. The backdrop of the 1940's Plane, a timeless gown from Bleubelle Bridal and the romantic, outdoor garden, combine for a lovely, vintage-inspired shoot at the perfect Savannah Wedding venue. 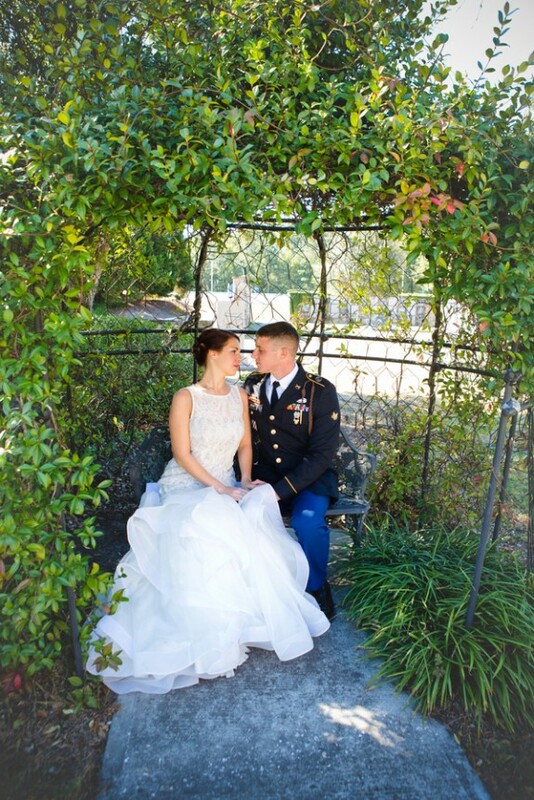 Fromthe National Museum of the Mighty Eighth Air Force: "As everyone knows, there is something urgently romantic about the 1940’s and in this styled shoot at the National Museum of the Mighty Eighth Air Force, we wanted to combine the concepts of today’s bride with a vintage setting. We joined the two by incorporating classic style shots & props (including our lovely couple next to the propeller of a 1940’s Plane) with the fresh look of a modernly dressed bride. The dress, created by the designer Theia, was a perfect fit, conveying a timeless feel with its lace top and an edgy twist with its ruffled skirt. Our vision was to intertwine both past & present. 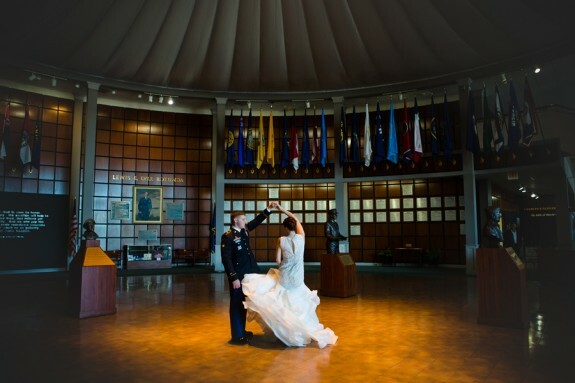 The National Museum of the Mighty Eighth Air Force was the perfect backdrop for this uniquely styled shoot and would make the perfect backdrop for any wedding, military or civilian. The romance & joy of a an event shine through in these particular settings, such as a green filled garden that hosts The English Countryside Chapel we chose to use as a backdrop. We imagine this couple to use traditional décor with a pop of color, as we used on the guest dining table. Their centerpiece would be elegant in its simplicity. Their reception would be an evening filled with fun and dancing like no one was watching. They would close the evening with class as they rush of to start their lives departing in an authentic 40’s jeep with vintage suitcases. Special thanks to our vendors, Brooke Roberts Photography, Bella Salon, A to Zinnas, Bleubelle Bridal."